I received this email a few days ago from Esko Reinikainen﻿ about the Digital Storytelling Festival in Aberystwyth next week. If you haven’t yet booked – there’s still time, but not a lot of it. I’ll be there and would love to see you there too. Look out for the digistories trade stand. 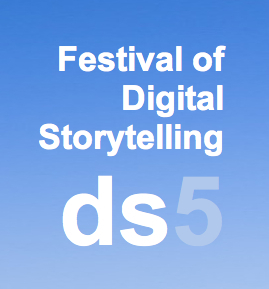 It is now less than two weeks until the fifth annual International Digital Storyteliing Festival and we are in the final stages of preparations for what promises to be our best festival yet! With an amazing line up including the inimitable Joe Lambert, continent straddling Diego Vidart, and a North Eastern flavour from Culture Shock, we are excited to be offering a day full of inspiring speakers, educational breakouts, and most importantly, the change to meet and network with other digital storytellers from the UK and beyond. Have you registered for the conference yet? Please be aware that official registration is through the conference website and while you may have rsvp’d on the event pages on the ning network or the facebook group, you still need to make an official registration. There are also some opportunities for sponsorship left, so if you or anyone you know would like to have their message seen by our lovely audience, they can find details about the different sponsoship packages here. We are also looking for a prize for the end of conference draw, if you know of any company that would like to donate a digital storytelling relevant piece of kit in exchange for a prominent mention and our undying love, please let us know! This year we will be live streaming the keynote speakers for the first time! If you have any friends on the other side of the world who could not make the event, although they will miss out on the live experience, the people, and the networking, they can still catch our main speaker via the web. The link for the live stream will be published on the conference website nearer the day. I’m really looking forward to meeting new friends and catching up with old ones in two weeks time in Aberystwyth!